View Bio | View C.V.
Ethan Gans-Morse is a critically-acclaimed composer and producer based in Southern Oregon. He is best known for composing and producing the opera, The Canticle of the Black Madonna, which The Oregonian called “A huge achievement… generous, carefully crafted and supremely compassionate” and Oregon ArtsWatch hailed as “One of the most exciting developments of the arts season.” He focuses on collaborative, socially relevant projects that foster greater human connection. As Eugene Weekly described his work, “Classical music is often rightly accused of ignoring the here and now. Fortunately, [composers such as Gans-Morse] are using classical and postclassical forms to help us understand the sometimes-unpleasant realities of the world we live in.” His most recent commissions include How Can You Own The Sky? A Symphonic Poem Honoring Native Wisdom, a program symphony commissioned by the Rogue Valley Symphony in honor of its 50th anniversary season, and Tango of the White Gardenia, a tango-infused opera in two acts for Cascadia Concert Opera in Eugene, Oregon. His instrumental works have been performed by numerous ensembles, including the American Creators Ensemble, the Quartetto Indaco, the Fireworks Ensemble, the Firebird Wind Trio, and the Eugene Contemporary Chamber Ensemble; his choral works have been performed by the Portland Vocal Consort (winner of their 2010 Composer Competition), Chorus Austin, the American School in Taipei, Taiwan, The Sandlapper Singers, and the Contemporary Choral Collective of Los Angeles. His music has been presented at numerous concert series, including the highSCORE Festival in Pavia, Italy, the Instrumenta Oaxaca Festival in Oaxaca, Mexico, the Music Today Festival, the Vanguard Concert Series, The University of Wyoming New Music Festival, the Oregon Composers Forum, the Oregon Bach Festival Composers Symposium, and the Ashland Winter Fine Arts Festival. 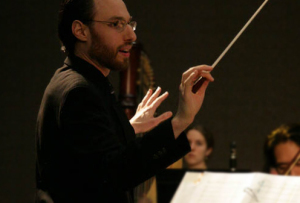 He holds a bachelor’s degree in music and linguistics from Macalester College and a master’s degree in music composition from the University of Oregon, where his principal teachers were Dr. Robert Kyr and Dr. David Crumb.